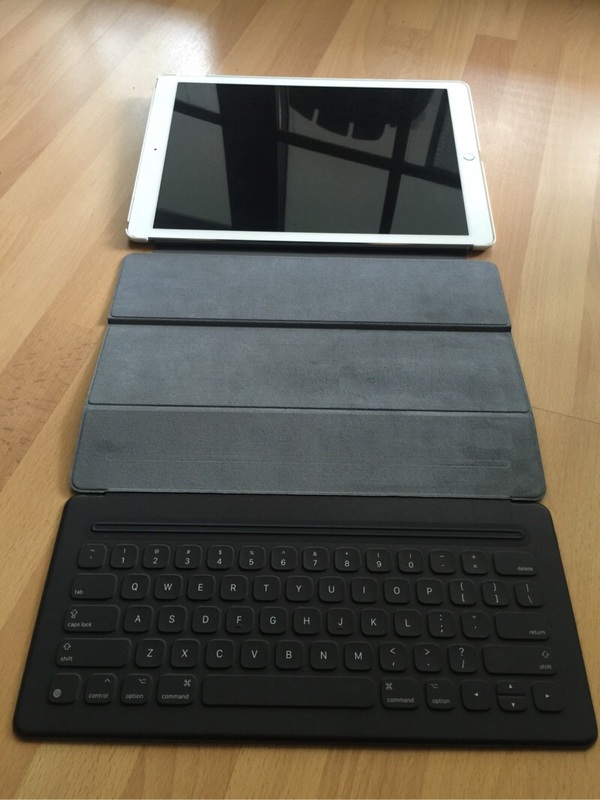 Smart Keyboard for iPad Pro: What Took Me So Long? We were walking around Edinburgh, Scotland a few weeks ago and like always I pop into any Apple Store I come across (especially one in other countries). On the second level of this particular Apple Store they had a 12.9" iPad Pro with a Smart Keyboard attached. So I started typing on it. Believe it or not this was the first time I had ever seen or used one and within less than 60 seconds I went from "I would never consider adding that kind of bulk and weight to my iPad Pro" to "I am getting one of these." I've had the 12.9" iPad Pro since December of 2015 and it has gone from being a bit of an experiment to see just how much an iPad Pro could replace most of my computing needs to being my MAIN computer. But still I resisted going down the path of carrying some kind of keyboard with my iPad. When at home I would use a Bluetooth keyboard and if I was away from home I just used the on-screen keyboard. But what I slowly came to realize is that by not having a dedicated physical keyboard for my iPad Pro I was reducing my productivity. If I was sitting on the couch and reading something on my iPad I was far more likely to keep right on reading news instead of writing something for my next 1WaySwim or GeekDad article. After all, that would require me to get up and go get my Bluetooth keyboard. My Bluetooth keyboard is dual use and most of the time it is connected to my family Mac Mini. So I would also end up being in the situation where one of my kids was using the Mac Mini so I would just suffer through using the on-screen keyboard. Ok, when I started using the term "suffer through" I knew it was time for a better solution. When the iPad Pro came out there was a lot of press coverage of Apple's Smart Keyboard and the only other main keyboard out at the time...the Logitech Create. But I didn't like what I was hearing from the reviews on either of these keyboards and I had somehow convinced myself that I didn't want or need a keyboard for my iPad Pro. The lessened learned here for me is that keyboards are a personal preference. I am more than capable of writing up several thousand words on the Smart Keyboard, but there is no point (and really, who would want to read it any way). It really comes down to how your fingers and brain react to the feel and response of the keyboard, and the only way to know is to go out there and use one. Well, when I finally did just that I knew almost instantly that I had been missing out on one hell of a typing experience. The Smart Keyboard attaches to the iPad Pro via the Smart Connector on the iPad. This does a couple of things. First off it provides power to the keyboard. So there is no need to charge the Smart Keyboard (there is NO battery and therefore no extra weight). The Smart Connector also provides the data connection. This is really nice, because the alternative is using Bluetooth and having used a couple of different Bluetooth keyboards with the iPad Pro I can say that the connection via Bluetooth is less than perfect. There is nothing more frustrating than being in the middle of typing and then dropping the connection. The Smart Keyboard attaches to the side of the iPad Pro that has the Smart Connector via magnets (similar to how the Smart Cover attaches to the iPad Air and the iPad Mini). The Smart Keyboard then folds up onto itself in a way that results in a small bump on the cover (with the thicker part of the cover being where the keys are folded up). The keys of the keyboard fold face first into the felt backing of the cover so they are well protected while in the folded position. Although I don't think the keys need a whole lot of protecting because they feel pretty darn rugged. Just like the Smart Cover, but with a "bump"
When you need to use the keyboard you just unfold it from it's cover position and then partial re-fold it again so that the magnet edge that is connected to the Smart Connector on the iPad meets with the groove in the keyboard above the top row of keys. In the photo of the groove below you may notice the texture of the keyboard itself, which is really pronounced in the photo. I wasn't sure I would like this texture, but ended up loving it. I prefer it to a more smooth and therefore slick surface that many keyboards have. In the typing position the iPad Pro is sitting at a bit of an angle. At home when sitting at a table or on the couch I find this angle to be just about right. However, using it on a tray table on an airplane I find the angle to be a bit too steep. It tends to lean the iPad back further than I would like and reduce the amount of room between the back of the iPad and the seat back in front of me. Not a big deal as it hasn't really caused any issues yet and I have been able to get a considerable amount of work done while on plane rides using this keyboard. But I tend to worry about the seat back in front of me suddenly coming back and smashing my iPad Pro into a very expensive pile of cracked glass. So I tend to keep the iPad Pro pushed a little closer to me to keep that nasty seat back away from "my precious." I have also found that movie viewing works really well at this angle too. A side view showing the typing angle while using the keyboard. Note that I have a back case (white) that is not part of the Smart Keyboard but works just fine with it (as most back cases do). Now for the most important aspect of this write-up on the Smart Keyboard. I type faster on this keyboard than any other keyboard I have ever used. Yes, you read that right. I can't begin to explain why. It is just something about the minimal key travel and the textured feel and extra grip on the keys that allow me to literally fly while typing on this keyboard. If there was a way to use this keyboard with my Mac at work I would. That being said, this WILL NOT be the case for everyone. As I said earlier, keyboards are very much an individual taste, so you will just have to try it out for yourself. The last piece of information I will leave you with is this...the Smart Keyboard works like a champ on your lap while sitting in the living room. When I switched from my beloved 11" MacBook Air to this 12.9" iPad Pro, the biggest thing I missed was being able to do just about anything from the comfort of my living room couch. With the Smart Keyboard attached to the iPad Pro I can now work that way again. The Smart Keyboard is just stiff and sturdy enough to function beautifully right on your lap and the keyboard itself doesn't flex or bounce. I don't see a lot of reviews that talk about this, so maybe I'm just the only tech geek that likes to type while sitting on a comfy couch...I don't think so. Anyway, there you have it. The Smart Keyboard is awesome while in lazy couch mode. Go out and try one for yourself and don't be like me and think that this form factor isn't worth at least looking at.